Stack Exchange Notifier is a handy extension for Google Chrome browser that displays your current reputation, badges on Stack Exchange sites and notifies you on reputation's changes. You will now get notified of comments on your own posts (questions and answers) and of any comments that refer to you by @username in a comment, even if you do not own the post (aka mentions). 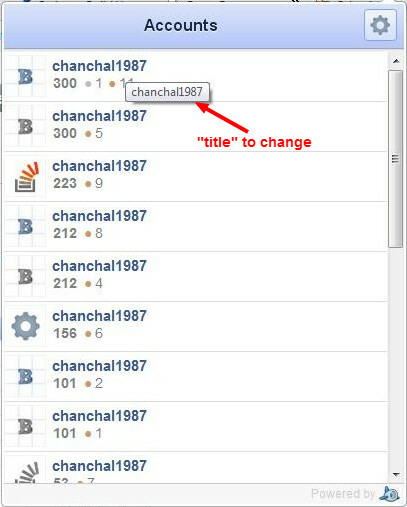 All StackExchange sites are supported. Written in Java, Google Web Toolkit under Eclipse Helios. Stack Exchange Notifier uses the Stack Exchange API and is powered by Google App Engine for Java. I will be porting extension to not use app engine back-end due to some limitations. New versions of the extension will be making direct calls to Stack Exchange API right from your browser. Please do not expect new versions of the extension any time soon. Sorry. - You will now get notified of comments on your own posts (questions and answers) that are not older than 1 year and of any comments that refer to you by @username in a comment, even if you do not own the post (aka mentions). This is experimental feature, let me know if you like/need it. - Fixes an issue when some users got empty Account view. - Fixed an issue with notifications. - Fixed an issue where some characters in response payload raised an exception when parsing to JSON. - New types of notifications added. Now extension notifies you on comments that are directed to you. Comments are expandable, so clicking on comment title will expand height to accommodate all available text. Application still in beta stage. I hope you're not having any problems, but if you are, please let me know. Leave your feedback and bug reports in comments. I'm available at: vladjan (at) gmail.com. I'm working on adding new features. I want to hear from the users and incorporate as much feedback as possible into the extension. Any suggestions for improvements/features to add? I'm new to SEApps, and given the design of it, I apologize if bug reports are not supposed to be "Answers". Please let me know and I'll move it to the OP comments. That having been said, I just installed this extension, and have a problem. Why can't I manually specify an OpenID in the extension configuration? I don't use a common vendor, I have my own. I think it is better to change the title of the "username" from "username" to "site name" in the "Accounts" page. It will help peoples to understand the site name easily. This is a very slick, awesome-looking extension with lots of potential. My main feature request would be for the ability to be notified of changes to any question (not just your own), the way that StackStalker does it. This would be great since it looks like StackStalker's author has lost interest in it and hasn't added support for arbitrary Stack Exchange sites yet. My display username is "Nomæd" with a unicode letter æ, but it appears as �� instead. I have 6 associated accounts, and the main one is http://atheism.stackexchange.com/ but I can't make it appear in my list of accounts in any way. Anyone has solutions, mainly for problem no. 2? Hmm, needz moar escaping: My notifications for the question Implement <!— language: lang-css --> in preview are showing as "Implement in preview"! Currently, you may experience some issues using extension, but most users will have no problems. You may notice too many errors in the logs, but there is nothing I can do with this now. Thanks for using my little app. but I thought I would let you know that I am having to re-authenticate every time I log in (and sometimes when I've already been logged in for a while). I use OpenID, and after telling OpenID to remember me, it's just a matter of clicking on your icon, clicking the OpenID button, and then waiting for the page that says "Yaay, we're logged in!" Otherwise, I absolutely love it! It looks nice and works well. I especially like that comments have part of the text (and all of it on hover). Thanks for all your hard work! As you can see, the HTML is actually being rendered. In the case of an HTML comment, the content is simply not displayed, but HTML content here is being showed as an un-ordered list item. Here is a link to the post from the screenshot. Yep, just as the title says, this extension is absolutely, 100% non-functioning on Linux. Congratulations, you've been successfully authenticated. Enjoy Stack Exchange Notifier! ...but the icon still has the red question mark on it. Attempting to re-authorize just opens an empty tab. If I restart the browser, I can (try to) sign in again, and am greeted with the same "success" message, but get the same results as before. For the first time in my life I used Facebook integration to login to stackoverflow, and what a surprise, I can't use it because I don't see how to configure it with it. Not the answer you're looking for? Browse other questions tagged app chrome-extensions notifier google-chrome extension . Stack Alert [Google Chrome Extension] - Keep tabs on your inbox without needing to have a Stack Exchange site open. Can there be a way to find a user given his email hash?